Henna for hair is a natural color that is used for coloring and toning. It is unlike artificial paint, it penetrates deep into the hair and encapsulates it and makes it stronger and shinier. In addition, unlike many retail products, it will keep the natural moisture of the hair. Henna for hair does not goes well with other synthetic preparations, so it is impossible to make hairstyle that requires additional shaping of the hair. Below the text read detailed instructions for coloring hair with henna. Learn which colors exist and what are all the benefits of natural products. How does henna plant look like? Henna (Lawsonia inermis) is a small desert tree or tall shrub. Grows up to six meters in height. There are side branches with leaves that grow in pairs. During the first two years, it is considered to be young and still under development. Mature plants have thorns, which develop during the inactive phase. In this way it protects itself against the animals that eat them. Originally from North Africa, West and South Asia and northern Australia. Henna produces most of colors when grown at a temperature in the range 35-45 C. In the areas where the temp. is below 11 degrees the plant will not flourish. The was plant was used even in ancient Egypt. The female mummy was found that the hair on one side was painted in bright red. The famous Egyptian henna for hair became widely known. Otherwise, today it is used for traditional drawing of arms in India. Drawing with henna on hands is done to brides on her wedding day. You can find red henna for hair, it is most common, there is also in black, blonde and brown. In the last two you should be especially careful because various additives are added, which are undesirable. Why are natural hair dyes good? 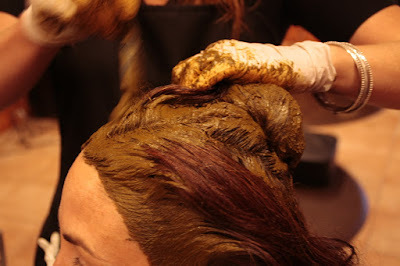 Henna hair dyes, as opposed to man-made ones, are made exclusively from natural ingredients. They do not damage the scalp and your health. They do not destroy the hair because they do not contain any harmful chemicals. They give it strength, volume and natural shine. In addition, the natural color of hair will relieve you of dandruff, and solve the problem of over-greasing. Artificial colors, on the other hand, contain a number of chemicals and additives that destroy the hair and its health. Regular use can lead to allergic reactions. Hair coloring with henna in blonde, red or brown is more complicated, but there are also many of its advantages. It provides excellent coverage of gray hairs, while it gives it alkaline balance. It can also serve as a good conditioner because it forms a protective layer on the hair. If you are wondering how long does henna last, you know that is a lot more stable than ordinary paint. Black shade can completely cover gray hairs. Kana hair is not the only natural colors which you can paint with. There are a few plants that are equally good and can change the desired color. So you need to try the indigo powder, colorless canoe or hay, sage, rhubarb root, Indian gooseberry, fenugreek and other plants. Before you start painting the hair with henna, do one allergy testing, it is mandatory. A little bit of mixture apply to the skin around the elbow and wait a few minutes. If there is no change in the skin it means that you are not allergic and feel free to start with its use. When it comes to henna for hair shades that exist are very interesting. Dyeing is especially recommended to brunettes and those who have black hair. They will get a darker tone, but much more natural refreshed color. If you are blonde or have a lot of gray hairs we recommend to do testing before dyeing. Protect your forehead with a greasy cream, neck and parts of the skin around the ears because it is very difficult to wash it off. Be sure to wear gloves during dyeing. Put on old clothes in order to be able to throw if after. For short hair one package of paint will be enough, for long you have to take at least one more. When to prepare henna for hair, make sure you put the gloves. In a glass bottle pour the powder of henna with hot water. Stir until the mixture is the density of the pudding. This will avoid creating lumps. Egg mass leave to stand for about 30 minutes. For a darker shade, add a cup of coffee or a few drops of red wine. If you want shinier hair mix egg yolk with olive oil and add the canoe. Wet your head, and let them dry with a towel. Separate the strands apply the color. Always dye the hair from the roots to the top. When applied Indian henna for hair, leave it on for a good 3-4 hours. The longer you hold the color will be brighter and more intense. Later, wrap it in a hat or an old towel. The color will be even nicer if you keep the head warm. Rinse your hair and then wash with a mild herbal shampoo. If you are dyed in this way, surely you already know that removing henna from hair is almost impossible. The color is permanent and can fade only with regular washing, only after some time. You specify by how many milliliters of oil you want to make a dressing. Let it be, for example, 20 ml of each oil. So you mix 20 ml of olive, argan and coconut oil together. Apply the mixture to hair from scalp to ends. What remains, do not throw away, but leave it for another time. Put a plastic cap and leave it overnight. Next day wash your hair with shampoo and massage your scalp. Rinse your hair with lukewarm water. This method for removing henna with hair can be repeated for 3-4 days, and then again in a few days. Stop when you notice that the color is removed. The juice of freshly squeezed lemon can dramatically lighten hair, even if there is henna on it However the juice is highly acidic and can make hair dry and stiff. This is not always the best method but sometimes can help. Apply coconut oil and leave it for 12 hours on hair. Then rinse with the shampoo. You will get the same effect as with lemon juice but will be a couple of shades lighter. After a couple of application you will minimize the color of henna. Black henna for hair does not come off easy. However, the use of oil from grape will fade it and you will also get a fine brownish hue. It needs to be applied evenly and kept more than 12 hours on the head. After that rinse and wash with normal shampoo. Mix a little baking soda with peroxide and lemon and apply on hair. Leave it on for 2 hours and then rinse. Do not repeat this process too many times because you can really damage your hair. What are the experiences with henna? When it comes to henna for hair experiences are usually totally positive. The process is completely natural, no chemicals, hydrogen and no damage to the scalp. We bring you a few comments in full. I used the henna and it is phenomenal and full of scented oils and my hair has become very soft. If you mix only with water, there is more color, and there are two variants of holding it on the head. If you want a reddish gleam put a bag on you head, and if not - nobody cares. The smell is not enchanting but not bad. It helped me. M.Z. The best henna is by far brown henna for hair. At least I consider it to be. I used imported one (Arab, Egypt) and the only problem for me was rinsing my hair because of the length. In addition I had no other difficulties. My hair has received phenomenal softness, beautiful color and luster. I tried dying my eyebrows with henna and the results are also very good. J.S. I used it for years – but the real henna not what is sold to us. We got them from Yemen, it's very nice and covered completely the scalp and hair. With the addition of coffee it gets a little darker. Its sent never bothered me, it always reminded me of fresh soil. In addition to coffee smell it was even nicer. Hair coloring with henna in blonde was great for me. Now it is as soft as silk, and I have not used other hair dyes since I do not need them. M.B. Where to buy henna hair dyes and what is the price? If you are wondering how much henna costs, the price is not much different from other preparations for hair dyeing. It can be found in almost every healthy food stores in packages of 100 g. There is also the well-stocked pharmacies and cosmetic stores. There are various manufacturers of natural dyes, however, pay attention that they are certified. Usually henna is mixed with a variety of metals and minerals, and it harms the hair. Henna for hair comes in various shades and is available online. You can purchase it in just a few clicks, again make sure of everything. Always inquire about the product before buying it. For the packing of 100 grams you will need to set aside about 6 dollars. For blondes and people who have a lot of gray hair we can never be sure what the color will turn out at the end of the dying process. It is recommended that you take a few strands of hair and apply the mixture on them to see what color you will get. After washing, you will see shade and on that basis determine what you ingredient you need to increase and which one decrease. Since we learned how henna is good for hair we recommend our article on the use of beer for the care of hair.